“What would you like for lunch?” she asked before I rushed out the door, my sneakers and breast pump balancing precariously in my arms. “You make lunch too?” I was almost dumbfounded and a little shocked. I assumed I would scarf down another frozen burrito in between breastfeeding sessions later that afternoon. And it was. Two hours later she had left, but she had made a lovely plate and left it by the folded laundry and most importantly next to my happily sleeping baby. In the two hours before she was gone, I had managed to take a walk by the waterfront and even take a long shower. I felt like I could breathe and almost relax. There are many images out there of happily blissed out sleeping new mothers with their new baby on their chests. That was not me. I was too exhausted, yet also too awake at the same time to actually rest unless someone else was with my daughter. I felt like I was on alert all the time and had a hard time calming myself. Even when my daughter was asleep during the day, I would try to close my eyes, but her slightest chirp or hiccup or grunt would make me spring to action. I hired a postpartum doula because I knew she would do more than be an infant babysitter. But I didn’t know how much more. She was incredibly skilled at babycare, but she also provided emotional support and seemed to put my needs first. It was a gift. During her weekly visits I could cry, vent, do something unrelated to baby life and feel like myself again for a few hours. I knew it would be valuable to hire a postpartum doula, but I didn’t know how important it would be to my wellbeing. As a sensitive writer, I have struggled with anxiety over the years and have learned tools to help. Yet, I believe even the most grounded of people will experience some sort of upheaval when a new baby comes into their lives. The demands are physically and emotionally exhausting. For the first six weeks of my daughter’s life, I started to cherish the times when the postpartum doula would come. I knew that even if it had been a rough night, I would have some help and just knowing that made a fussy night more bearable. I feel grateful that I have close family and friends nearby (and that oh so amazing meal train! ), but having the presence of the calm postpartum doula offered another layer of support. She was unobtrusive and seemed to know just how to help, even if I didn’t know what to ask. She folded laundry, helped me bathe my daughter, answered the door and politely let visitors know if I needed rest (something I still struggle with), and chopped sweet potatoes and kale. She directed me to interesting resources and useful podcasts, paid attention to my emotional health in case postpartum anxiety or depression crept in, and was an expert at soothing my newborn. When the idea of venturing to a playgroup alone with my daughter for the first time felt overwhelming, she joined me on the mission. She also listened when I wanted to not talk about baby life. She helped me see the humor of leaking breast milk and reminded me to drink water and to remember that the sleep deprivation was temporary. While hiring a postpartum doula can be costly, I believe it invested in my health. 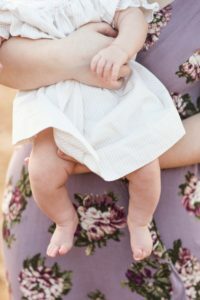 Most doulas (postpartum or labor) also seem willing to work with families around payment and I believe that these precious beings are helping families not just for the money. They do it because they want to support others. During pregnancy, I met with a few different postpartum doulas to find one that seemed like the best fit for me and I encourage expecting mamas to do the same. I also discovered a volunteer service run by Good Beginnings of Central Vermont that provides free volunteer support to new parents. While it’s been awhile since I’ve seen my postpartum doula, I often think of her and wish she could see my daughter thriving at daycare and holding her head up on her own. I wish she could see me, sitting at my desk and feeling more like myself. However, I am sure she is already busy bringing breakfast to another new mama and swaddling another tender new baby.